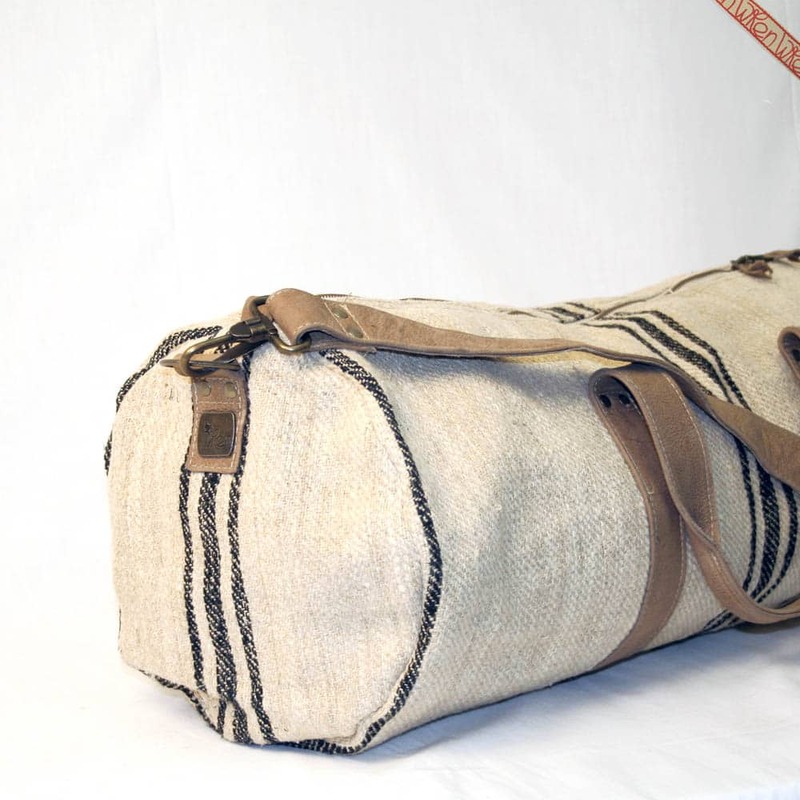 Introducing the Antique Linen YOGA Bag. And the name pretty much gives away its ultimate use. You can fit a standard yoga mat, towel and shoes in ….much more (see below what we unpacked from the yellow and blue stripe Yoga Bag). What more do you need when going to the yoga studio? Or, in my case – travelling (I used a yoga sample bag when travelling to Germany earlier this year). 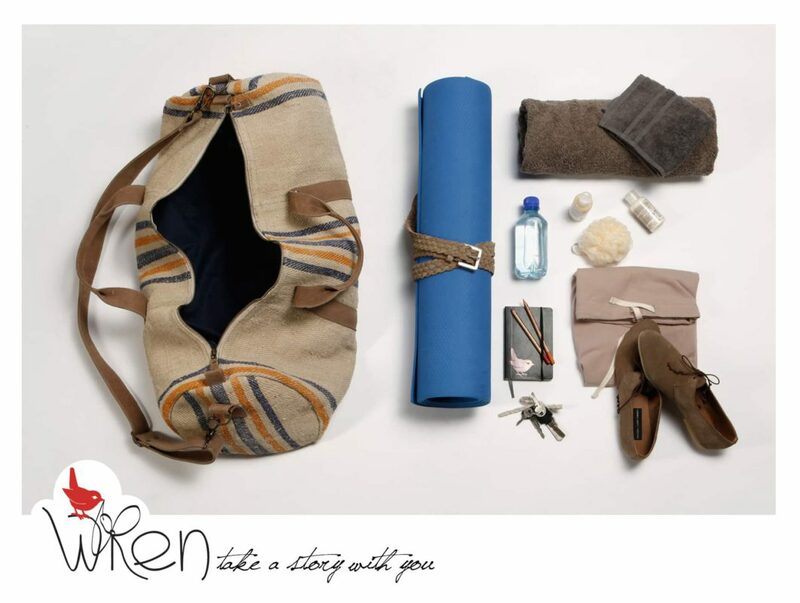 The Antique Linen YOGA Bag is made from heavy-duty antique linen fabric (with a gorgeous herringbone texture). 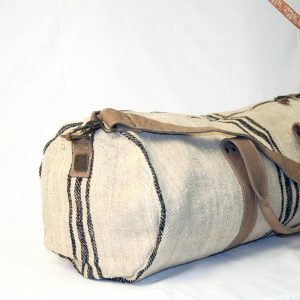 Just like the Antique Linen Duffel Bag. So a bit of ruff-and-tough use is not going to hurt this bag. 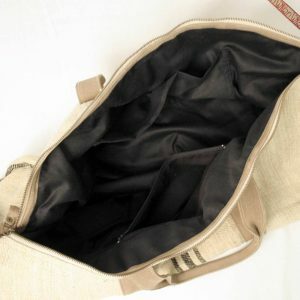 The inside is lined with a cotton: On the one side there are two open pockets and on the other there is a zipper for all your items that need to be kept safe. The straps and handles are Nubuck leather (which is soft, matt and untreated). In case you are wondering what happens when this bag gets wet? Don’t. We have treated it with nano technology (an eco-friendly coating) making it water and dirt resistant. Size-wise we are a little restricted by the width of the antique linen grain sacks but we managed to make a plan to offer you a 70cm long and 28cm wide bag. This entry was posted in Blog and tagged antique linen, Bag, grain sack, linen yoga bag, travel, weekender, yoga mat, yoga mat bag. Your bag is so beautiful,Wendren!Well done! All your bags are so beautiful.I look often in your shop.You are so creative! Oh,I read you will fly to Germany!You already know when?